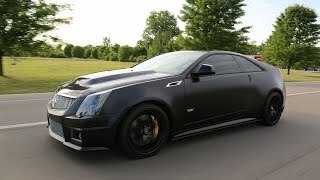 2011 Cadillac CTS-V Coupe made its debut at the 2010 Detroit Auto Show. CTS-V Coupe combines the new CTS Coupe's dramatic design with the 556 HP supercharged V-8 engine from the CTS-V sedan. The result is a luxury sports coupe aimed at driving enthusiasts. DETROIT – Cadillac today announced the 2011 CTS-V Coupe, which debuts at the 2010 North American International Auto Show in Detroit. 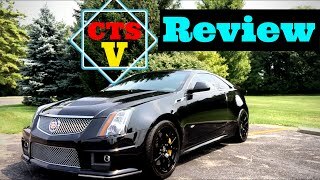 It combines the new CTS Coupe’s dramatic design with the 556-horsepower (415-kW) supercharged V-8 engine from the CTS-V sedan. The result is a luxury sports coupe aimed at driving enthusiasts. The CTS-V Coupe begins production this summer. Its suite of technical and performance elements includes Magnetic Ride Control, racing-bred Brembo brakes and an available automatic transmission with paddle-shift control. The V-Series Coupe includes a unique grille that doubles the car’s air intake volume, an important enabler for its high-performance capabilities. It is also visually identified by a raised center section of the hood that provides clearance for the supercharger, as well as specific front and rear fascias. Like the CTS Coupe, its exhaust is centered inside the rear fascia, but with unique twin outlets. The car rolls on 19-inch cast aluminum wheels, available in either painted or polished finishes, and Michelin Pilot Sport 2 performance tires. The CTS-V Coupe’s rear track is nearly an inch wider than the CTS-V Sport Sedan, adding to the car’s aggressive stance and enabling an extra measure of handling capability. The current CTS-V Sport Sedan has quickly established itself among the world’s highest performing luxury sedans, becoming the first production four-door on street tires to break the legendary 8-minute barrier at Germany’s famed Nürburgring. The new V-Series Coupe’s sleeker shape and slightly lower mass ensure a similarly high level of performance. Inside, the 2+2 cabin combines performance and luxury. A new Saffron interior trim color is offered, with contrasting microfiber seat inserts and stitching on the upper trim areas. The CTS-V Coupe’s design is a clear visual statement of the technical precision and performance intent of the car. The Coupe has the same wheelbase as the CTS-V Sport Sedan, but its overall height is about two inches (51 mm) lower and its overall length is two inches (51 mm) shorter. The two models share only the instrument panel, console, headlamps, front fenders and grille. 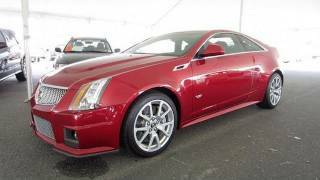 The CTS-V Coupe employs the LSA 6.2L supercharged V-8 engine also found on the CTS-V Sport Sedan. Rated at 556 horsepower (415 kW) and 551 lb.-ft. of torque (747 Nm), it is the most powerful engine offered in Cadillac’s history and propels the CTS-V Coupe from 0-60 mph in 3.9 seconds. The LSA engine features an intercooled Eaton supercharger system, premium aluminum-alloy cylinder heads and numerous details designed to ensure it makes its power as quietly and smoothly as possible. The supercharger, for example, has a unique, four-lobe rotor design that enhances quietness while also optimizing the performance parameters of the engine. A pair of six-speed transmissions is offered in the CTS-V Coupe: a Tremec TR6060 six-speed manual with a dual-disc clutch and a Hydra-Matic 6L90 six-speed automatic with paddle-shift control. Performance Algorithm Shifting is part of the 6L90’s programming and provides a performance-oriented shift pattern during sustained high-performance driving. As with many Cadillac models, the driver needs only to slide the shifter into the manual “gate” to put the transmission into that more aggressive mode. The paddle shift control requires no shift lever movement. Steering wheel thumb controls allow immediate and quick tap up/tap down gear selection. The V-Series reaches elite levels of road-holding performance, but also maintains the poise of a luxury car in “regular” driving conditions. The technical enabler of that dual-mode driving character is Cadillac’s landmark Magnetic Ride Control. It is standard on the CTS-V Coupe and is the world’s fastest-reacting suspension technology. It uses shocks controlled by advanced magneto-rheological technology, rather than mechanical valves, to greatly accelerate response time and precision. Electronic sensors at all four wheels literally “read the road” every millisecond, making constant adjustments to damping to create virtually instantaneous and extremely precise control of body motions. This is of particular benefit for a high-performance car because it helps keep the car very composed during hard cornering, acceleration, braking and other dynamic maneuvers. The Magnetic Ride shocks also enable a broader range of damping control to optimize the ride and handling for all driving conditions. In the CTS-V Coupe, an extra measure of control is offered, with two selectable modes (Tour and Sport), enabling the driver to tailor the suspension for grand touring or more spirited performance driving. CTS-V includes sophisticated braking and tire systems, in partnership with two companies renowned for high-performance technology: Brembo and Michelin. Brembo brakes are at all four corners and include powerful, six-piston calipers in the front and four-piston calipers in the rear. Slotted and vented rotors enable strong initial braking force while optimizing heat resistance and eliminating fade. The brake rotors from Brembo employ a “dual-cast” technology that combines cast iron and aluminum, resulting in excellent performance and weight reduction. CTS-V also includes an electric parking brake, enabling more legroom for the driver, key for high-performance driving. Michelin partnered with Cadillac engineers to develop its acclaimed Pilot Sport PS2 summer tire for CTS-V and its exclusive 19-inch alloy wheels. The tires support high levels of grip in track conditions, while also affording good performance on the road. Recaro performance driving seats are optional in the CTS-V Coupe and provide excellent support for spirited driving. These 14-way adjustable performance seats include pneumatic bolster controls in the seat cushions and backrests. The CTS-V Coupe also includes an exclusive new Saffron color option for the interior, providing a contrasting color accent carried on the seat inserts, as well as the stitching, which highlights the craftsmanship of the instrument panel, center console, door trim and seats. The steering wheel, seat inserts and shifter are covered in microfiber, providing the luxurious character of suede without suede’s inherent drawbacks of difficult care and moisture sensitivity. These accents are standard, elegant to the touch and help support high-performance driving. The car’s integrated center stack is trimmed in Obsidian black material that is also applied to the center console and door trim. Just like every CTS, the V-Series includes a hand-stitched instrument panel, door trim and center console. Leading-edge infotainment features extend to the V-Series. They include a 40-gigabyte hard drive, advanced navigation system with a deployable screen and Bose digital surround audio, as well as factory-installed Bluetooth phone integration, all standard features on the V-Series.